Deb's Cup of Tea: I'm beginning to hate these clothes. I come in at the end of a day of shoveling and I just pile them inside the bathroom door. Two pairs of socks, a pair of sweat pants under a pair of jeans and a tee shirt. I looked at the pile this morning and shuddered. It just doesn't make sense to dirty more clothes. I remember when I went to court for the divorce pronouncement. I went through my wardrobe and selected a jumper and turtleneck. When I came home, I washed those and promptly gave them away. I decided when I was picking what to wear, that whatever it was would always be associated with the dissolution of my marriage so I picked something I didn't mind giving away. 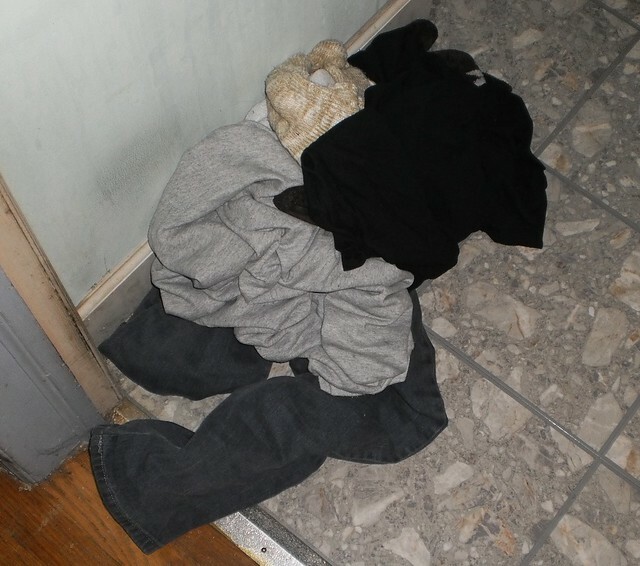 I look at this pile and think, "These clothes will always be associated with the great blizzard of 2011." I will just toss them in the wash. There are worse things than being divorced.